We've simplified how to reference journals in the Leeds Harvard and Leeds Numeric styles. The Library has made changes to the Leeds Harvard and Leeds Numeric referencing styles, following a survey of staff and students earlier this year. Print journal articles and online journal articles are now referenced in the same way, which means that you do not need to add [online], the access date, or the URL to journal article references. This only applies to journal articles; no other online items are affected. 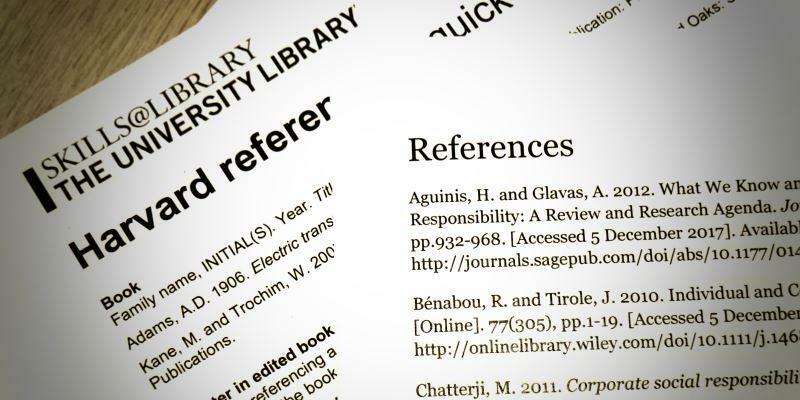 We have updated our referencing examples so that you can see how a journal article reference should look. Just go to the Leeds Harvard or Leeds Numeric examples pages to find the guidance. In April and May 2018 we surveyed staff and students to find out whether the Referencing Policy was working and whether there were any problems with the referencing styles each School is required to use. From the survey responses, we learned that many people disagreed with the rules about adding the URL to online journal article references, and that this caused confusion as different module handbooks had different advice about what you should do. We have decided to remove the URL from journal article references to reduce confusion and improve the consistency of information and assessment across all modules that use the Leeds Harvard or Leeds Numeric styles.